Give your bathroom continuity by matching the cabinet knobs to the shower head and water faucets. And don’t be afraid to explore new options. Hint: brass is back! Retro colors in old bathrooms can be quirky and fun. Usually, though, they just don’t work. 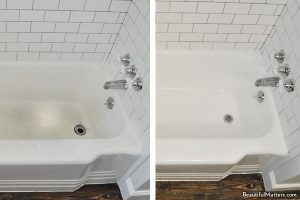 Rather than replacing that green tub or pink sink, consider having them re-glazed by a professional for a lot less money. It’s thriftier than tile, less maintenance than wood, and adds casual cottage charm. The water-resistant variety will stand up to the inevitable splashes and never needs painting. An antique dresser and mirror can make a one-of-a-kind bathroom vanity. 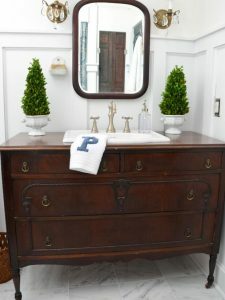 Find a dresser with a distressed paint treatment. Then, make a cutout in the top and drop in a sink! Don’t let the bathroom be the “forgotten” room. Keep it up to date with plenty of function and a little pizzazz. 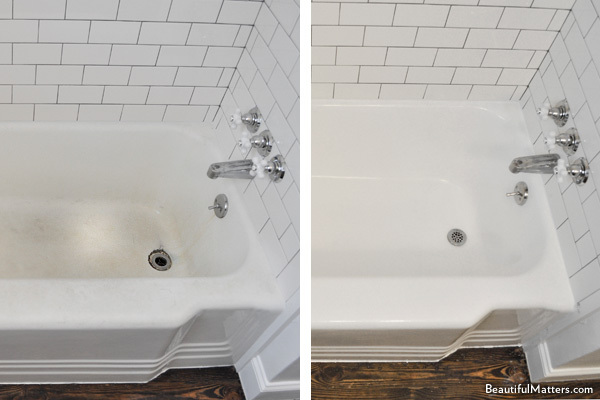 Above all, make sure it’s always squeaky clean!